Going birdwatching in Iceland and want to know what bird species call Iceland their home, and in what regions can they be found? During which seasons is it possible to see the iconic Atlantic Puffin? And just what accommodation options are available for those twitchers eager to discover birds of Iceland? With open skies ever beyond our reach, the concept of flight amongst humans has, for centuries, driven our creativity and storytelling, our penchant for dreams and for pushing technology, and ourselves, to ever greater limits. It is no wonder then that we have long been fascinated with birdlife. Boasting an aerial freedom, speed and aerobic ability that we can only look upon in awed craving, birdwatching is one of those gentle pastimes that allows one to appreciate the differences and subtleties found throughout the natural world. Thankfully, birdwatching and wildlife tours are an ever-growing activity in Iceland as more and more people realise just how many unique and captivating species can be found here. In 2011, around 376 species were spotted in the country, with approximately 80 of those thought to nest here permanently. Birding in Iceland also offers a fantastic education of the country’s wildlife—for example, did you know that the second largest migratory route of any animal is undertaken by the Arctic Tern, travelling 80,000 kilometres from the Antarctic coast to nest in Iceland? The national bird of Iceland is the Gyrfalcon, the largest kind of its species. Long held in high esteem as a hunting bird, the Gyrfalcon has been tracked and protected in Iceland since the 1980s, with breeding numbers here higher than ever in recorded history. However, there is one bird that has since surpassed the Gyrfalcon’s association with Iceland, a creature whose plumage and character feels a touch more fitting with the national identity—we speak, of course, of Atlantic Puffins. Most casual birdwatchers to Iceland will be interested in where and when they can find Iceland’s most iconic bird, the Atlantic Puffin. With its bright and colorful bill striking a stark contrast with its black and white colouring, the Puffin is internationally considered a symbol of Iceland as a country, filling its souvenir stores with cuddly replicas and ornamentals. Puffins are migratory creatures, spending much of the year at sea; they arrive in Iceland for breeding in May and leave again come late August. During this period, Iceland is home to 60% of the world’s breeding population. Atlantic Puffin has long been a source of food for the Icelandic people, with locals venturing to their favourite spots each year in order to net, then cook up fine and authentic cuisine. Whilst this might be a tad stomach churning for international visitors, it should be known that such practices are sustainable in Iceland, with limited licenses being provided, as well as set hunting seasons annually. Birdwatchers will need to be aware of regions and seasons in which they can locate the exact birds they are looking for. However, given that Iceland is a rather large country, this means that prior planning is needed, not just in terms of how you plan to traverse the great distances between birdwatching spots, but also regarding what accommodation can be found nearby each one. So, what are the major regions for birdwatching in Iceland, and what species and accommodation can be found to suit? There are a great many spots within the Snæfellsnes Peninsula where birdwatchers will find a wealth of soaring and nesting species. Puffin watching tours can be taken from Grundarfjördur, a town mostly known for the “mountain like an arrowhead”, Kirkjufell, as so famously showcased in HBO’s fantasy series, Game of Thrones. Should you be looking for accommodation options nearby, there is no need to look further than this 70m² property in Ólafsvík, comfortably able to fit four travellers in a cosy, home-away-from-home setting. For smaller parties, the modernist home Nónsteinn, located in Grundarfjörður, will fit two people, as well as providing a fully equipped kitchen, comfortable double bed and amazing views of the sea and mountains. The pillars of Lóndrangar are among the most notable bird watching spots in the region; it is possible to spot such species as northern fulmar, black-legged kittiwake, puffins and the common murre all nesting amidst the rock stacks’ cliff faces. The Lóndrangar pinnacles are composed of basalt and stand 75 and 61 metres respectively. Accommodation close to Lóndrangar includes such properties as Garðabúð Cottage and Arabúð Cottage, both of which can be found between the towns of Hellnar and Arnarstapi. Incredibly serene, remote and compact, these cottages benefit from the nearby Maríulind spring—known to heal those who drink from it—and fantastic sweeping views over the Snæfellsnes Peninsula itself. The Westfjords is one of the more isolated and undeveloped of Iceland’s regions, making it fantastic for spotting native wildlife. Covering approximately 22,271 km², this is a large area, boasting some truly striking scenery and attractions, as well as an abundance of quaint fishing villages. Hornstrandir Nature Reserve is 580km² nature reserve in the north of the Westfjords. Aside from the 260 species of flowering plants that can be found there, the reserve is home to two of the largest bird cliffs in Iceland, beaten out only on by Látrabjarg. Látrabjarg cliffs are among the top birdwatching spots in Iceland, also serving as the westernmost point of both the island and Europe itself. Safe from the ever-hungry Arctic Fox, the nesting birds here are without fear, swooping with ease from their cliffside abodes out to the feeding ground that is the surrounding Atlantic Ocean. Because of the stunning aerial displays that can be found here, Látrabjarg can justify its place as the Westfjords’ most visited guests attraction. Be warned, however, the cliff faces can be unstable at the edges due to burrowing birds. Looking down, one might also contract a dizzying effect paired with an imminent and newfound fear of heights. Approximately two kilometres in length, Vigur is an island off the Westfjords with a reputation for both sheep farming and birdlife. Arctic Skuas can be aggressive here—sometimes, it is necessary to wave a stick over one’s head to avoid being dive bombed! However, a far more symbiotic relationship exists between the island’s semi-permanent residents and Eider Duck. As added protection, these ducks nest close to people, allowing island residents to collect the ducks’ precious down during the year. Of course, there can be no birdwatching trip around the Westfjords without mentioning Reykhólar, a small village in the Westfjords known for its abundance of winged wildlife. With its rich wetlands, marshes and ponds, the village has only 120 permanent human inhabitants, a figure widely outnumbered by the likes of its resident birdlife. Fully protected since 1994, the White-Tailed Eagle is one of the Westfjords most famous residents and is, of course, one of the major species that twitchers are looking to see. Those looking to learn more about this unique species can visit the White-Tailed Eagle Centre, an organisation that aims to promote population numbers in Iceland. This is the only type of centre of its kind in the world. There are a number of different accommodation options for those looking to spend time birding in the Westfjords. For instance, you could spend time resting up at this private luxury house in Súðavík village, boasting four bedrooms, sleeping space for eight and fantastic views over the mountains and ocean. Another option, this time located in the town of Patreksfjörður on the southern edge of the Westfjords, is Bjarkarholt cottage,—which is in close proximity to the Látrabjarg bird cliffs. This cottage can sleep six people and contains all the amenities one could need during their time in the Westfjords, including a spacious kitchen area, Wifi access and a gas BBQ. Those staying local to the Capital Region need not worry about missing out on Iceland’s eclectic birdlife as there are plenty of spots both within Reykjavík city and its surrounding landscape that more than fit the bill. Úlfarsárdalur wetlands lie on the Úlfarsá river and provide a great site for spotting waders like Dunlin, Snipe and the Black-Tailed Godwit. Deeper into the valley’s heathlands, twitchers will find Golden Plovers and Meadow Pipits, while those sticking to the river will find Greylag Geese, Tufted Ducks and Mallards. As a side note of interest, the first Golden Plover that arrives in Iceland each year is considered a sign for the start of summer. The wetlands of the Elliðavatn Lake area are another fantastic place to see Whooper Swans, Greylag Geese, Teals, Mallards and Tufted Ducks. There are also a variety of waders who call the area home and during the summer months, guests will also encounter such species as Arctic Tern, whilst winter sees the introduction of Goosanders, Widgeons and Scaup to the lake. The pine forest of Öskjuhlíð hill is another location to spot the capitals’ birdlife. Nestling amongst the trees include the likes of redwings, blackbirds, starlings and redpoll. Though far rarer, it is also possible to spot such species as the Woodcock and Long-Eared Owls. In Laugardalur valley, one can find Reykjavík Botanical Gardens, a tranquil and lush space that attracts the likes of Blackbirds, Red Wings and Goldcrest. As with other locations around the city, this is also a premier spot for stumbling across Greylag Geese and Mallards. Most visitors to Reykjavík will, at one point or another, visit the downtown pond, Tjörnin lake, even if just on a passing stroll. Not many know, however, that Tjörnin is among the city’s prime birdwatching spots, offering a variety of species that can be appreciated from this dense, urban centre. Accommodation options for holiday cottages in the Capital Region include such properties as Brattagata Guesthouse, a gorgeous rental, based in one of the city’s most beautiful historical houses. Those wanting to remain in the city centre could check out this beautifully renovated studio, a sophisticated two-person property that is surrounded by some of the finest restaurants in the country. 15 kilometres away from the city, guests could also stay at this large home in Hafnarfjörður, a two-story house that includes amenities such as a jacuzzi, BBQ and spacious living areas. Lake Mývatn is arguably the best spot for birdwatching in Iceland. It is a volcanic, yet lush paradise that offers captivating birdlife in the most stunning of surroundings. For example, Mývatn and the nearby Laxá river contain more species of duck than anywhere else on the planet, surely a point of worthy of note for any serious twitcher. Langanes, itself shaped like a duck, is a small peninsula located in the northeast of the country; measuring out at 40 kilometres (25 mi), it is no surprise that Langanes literally translates to “long peninsula”. At Langanes, guests can see an untold number of Iceland’s Kittiwakes, Auks and Guillemots, as well as the uncommon Brunnich’s Guillemot. The area also holds the third largest nesting area in the world for Gannets. Other attractions in the Mývatn area include the likes of Dimmuborgir, a distinctive expanse of lava formations, and the Mars-like landscape of Námaskarð Pass. Because of attractions such as these, the Lake Mývatn area is considered to be a staple stop on the Diamond Circle sightseeing route, the northern alternative of the capital region’s’ famed Golden Circle route. As one of Iceland’s most popular sightseeing areas, there are, of course, a variety of holiday cottages available. 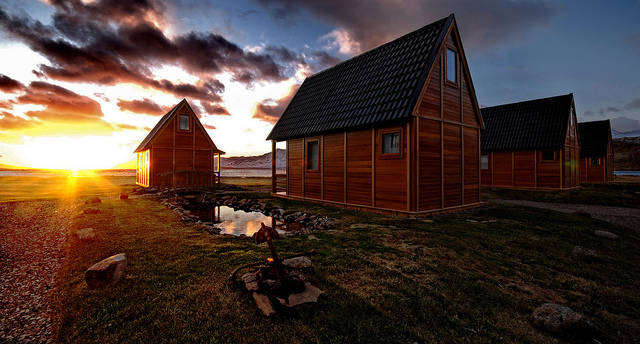 The two-bedroom Álfahlíð cabins are one such option, with its lakeside views, dining and kitchen facilities and sleeping room for six people. A little further from the lake, visitors could choose to stay in the stunning and comfortable Laugar Cottage, or alternatively, Mánalundur cottage, approximately 35 minutes drive from Akureyri. Those visiting Akureyri are recommended to partake in a whale watching tour, which provides them with a close up look at some of Iceland’s largest, and most beloved underwater mammals. To top it off, whale watching tours are another method for seeing Iceland’s birdlife—crowds of birds flying over a spot of the ocean will often indicate feeding grounds and are thus a prime location for spotting wildlife. The Eastfjords, like the Westfjords, are isolated and rarely visited by international guests, making them a prime location for spotting birds, often attracting visiting migrant species from mainland Europe. Aside from birds, other interesting wildlife species can be found here; for instance, it is the only location in the country where it is possible to see herds of wild reindeer. The Eastfjords are also known for their striking beauty, best characterised by their jagged black coastlines, pointed mountains and rough backcountry roads. Images of such attractions as Vestrahorn mountain have long showcases just how incredible this landscape is, making it a favourite among photographer and nature-lovers alike. The island of Skrúður is known for its large colony of Gannets, as well as its mythical place in Icelandic folklore. According to legend, this tall and towering islet haven was once owned by a giant, guilty of abducting a young woman from the mainland and holding her prisoner there. Though there are no signs of the giant or his prisoner today, guests are sure to find stunning scenery and unforgettable wildlife. The island of Papey is an excellent site for spotting puffins, the creatures so comfortable with human presence that it is almost possible to get within touching distance. By now, you’re likely aware that there are many places to see puffins whilst in Iceland, but this is truly one of the gems. Options for holiday cottages in the Eastfjords begin with Sólbakki summerhouse, located within ten minutes drive from the charming town of Egilsstaðir. The property boasts a fantastic sundeck, complete with jacuzzi, which provides great panoramic views of the surrounding area. Another option could be one of the Mjóeyri Cottages, each of which can be found within driving distance of Eskifjörður town.